Planet Hugill: From Advent to Epiphany: a seasonal miscellany with carols, motets and more. 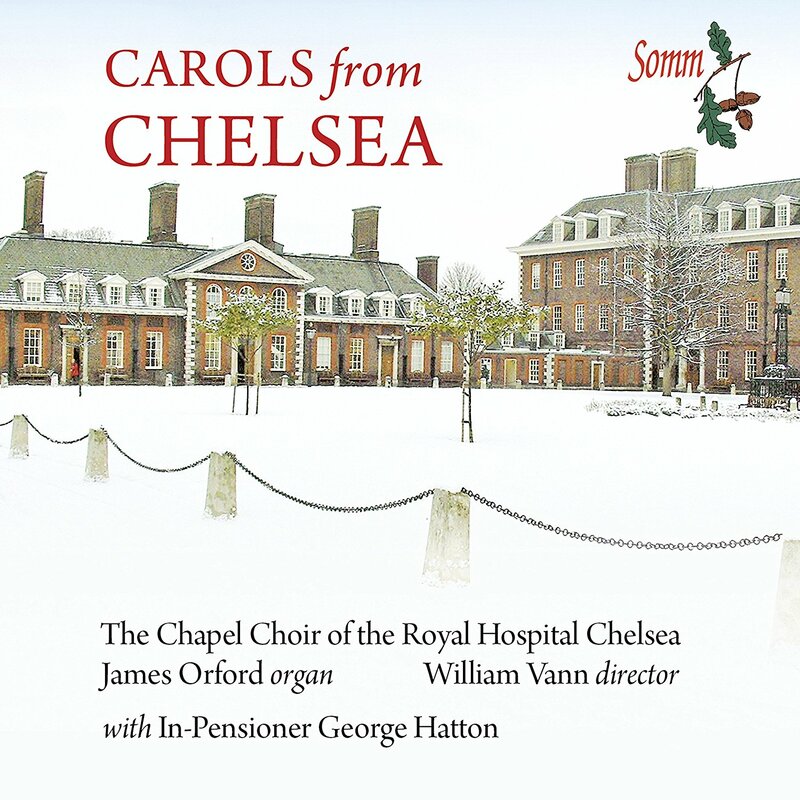 White Christmas features on Carols from Chelsea, where the chapel choir of the Royal Hospital Chelsea, director William Vann with James Orford (organ) perform the work at the end of their programme of carols. 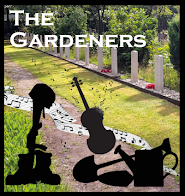 But there is an interesting twist to their version, Vann, Orford and the choir are joined by In-Pensioner George Hatton, one of the residents of the hospital, for a lovely performance of Irving Berlin's classic. 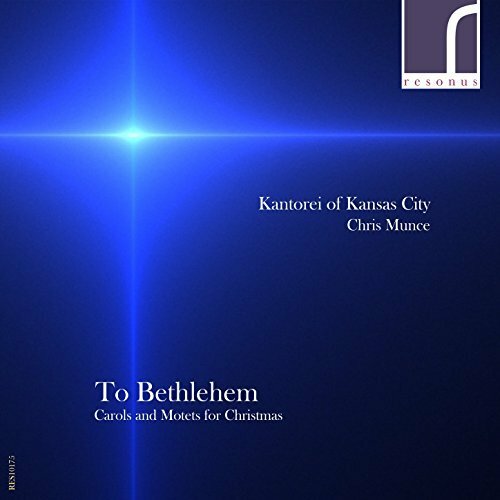 Elsewhere on the disc Vann's choice is an intelligent mix of the popular and the lesser known, including RVW's The Truth from Above, Rutter's Dormi jesu, Warlock's Benedicamus Domino, Michael Head's The Little Road to Bethlehem and Francis Pott's Hodie Christus natus est, plus of course two David Willockcs arrangements. The choir (recorded not on home territory but at Temple Church) uses young professionals (older than the Selwyn students), and they give finely poised, shapely and fine-grained accounts of the carols, culminating of course in White Christmas which is a total delight. 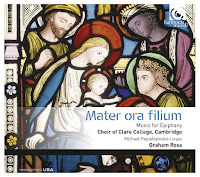 Another London chapel choir, the Choir of Her Majesty's Chapel Royal, directed by Huw Williams with Martyn Noble (organ), has produced a carol disc. 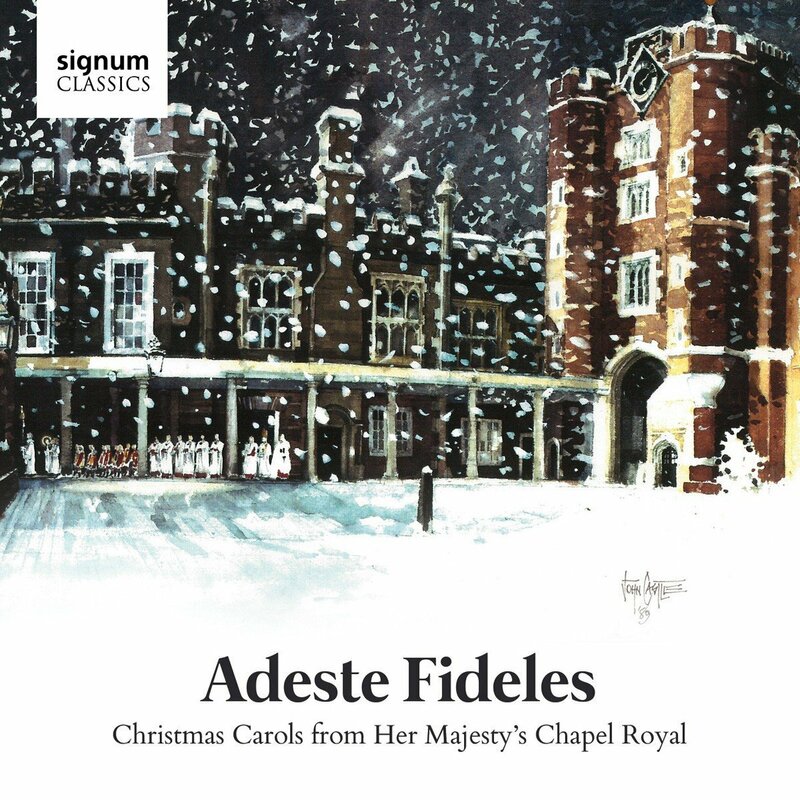 Adeste Fideles, Christmas Carols from Her Majesty's Chapel Royal has David Willcocks arrangements, plus those by Malcolm Sargent, George Guest, Andrew Carter and John Rutter, alongside lesser known pieces and contemporary works such as Jonathan Dove's atmospheric The Three Kings. And not all are carols, we have Thomas Weelkes Hosanna to the son of David, Stravinsky's Ave Maria and a finely controlled account of John Tavener's The Lamb, as well as Britten's New Year's Carol. We are back to boy trebles on the top line (and looking at the choir's photo, I was impressed with the racial diversity in the treble line-up), but recorded in the relatively intimate chapel at St James's Palace. The performances are full of vitality and character, I particularly liked the way we move from Rutter's Sans day carol to the vibrancy of Mary Had a Baby (an American spiritual arranged by Malcolm Sargent). A number of the composers had links with the Chapel Royal and the Royal family, giving the selection a nice feeling of family. 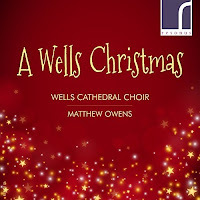 Over at Wells Cathedral, A Wells Christmas sees Matthew Owens conducting Wells Cathedral Choir, with Jonathan Vaughn (organ). Here we have a number of Willcocks arrangements, plus those of Sargent, Rutter and Carter, but there is also Matthew Owens' own lovely Lullay mine liking, two of Rutter's own pieces, Bob Chilcott's The Sparrow's Carol and Thomas Hewitt Jones' What child is this? I suspect that this repertoire is a strong reflection of what goes on at Wells at Christmas. 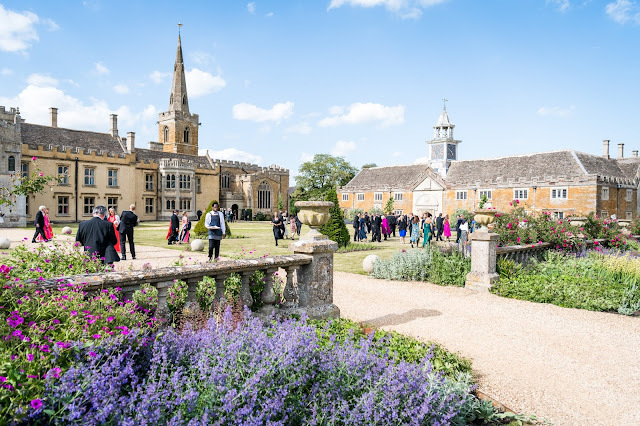 Both the boys choir and the girls choir are used on the recording, making a total of 36 trebles, with 12 men, (compared to the Chapel Royal's 11 trebles and six men). 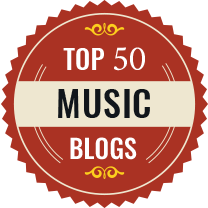 The performances are poised and beautifully finished, with a lovely sense of control. Thomas Hewitt Jones has his own disc too, almost a Christmas single! Christmas Party features three short pieces (total running time around 13 minutes), with Hewitt Jones' Christmas Party for solo violin(Simeon Hewitt Jones) and orchestra (the Royal Ballet Sinfonia, conductor Gavin Sutherland), proving a lively arrangement of Christmas carols and songs, plus a couple of short items including the carol Child of the Stable's Secret Birth. 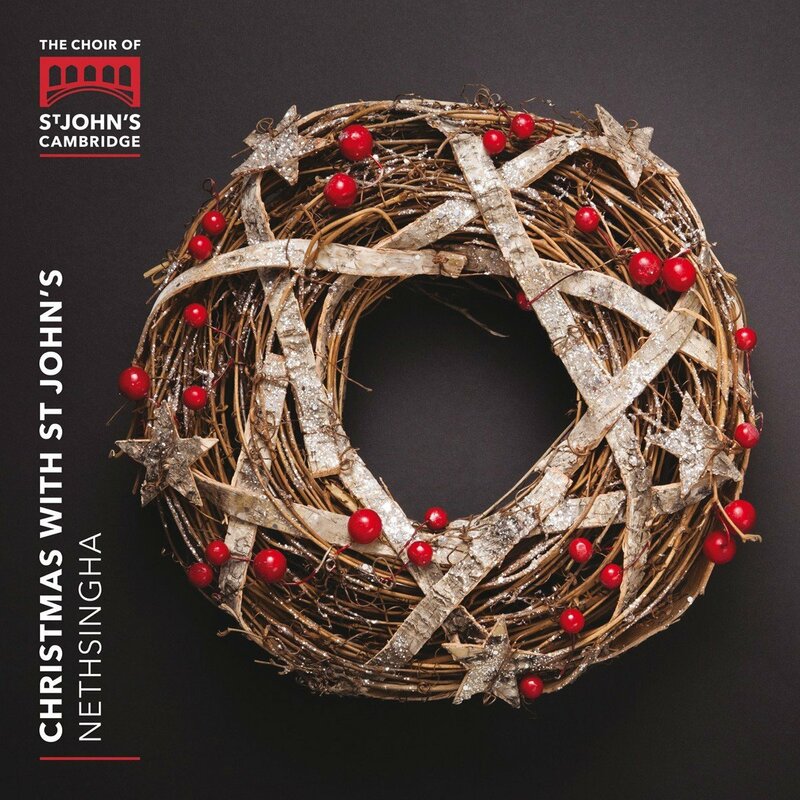 We return to an all male choir for Christmas with St John's which features the choir of St John's College, Cambridge, director Andrew Nethsingha with Joseph Wicks (organ) performing a number of Christmas choral favourites ranging from William Mathias' Sir Christemas to Elizabeth Poston's Jesus Christ, the Apple tree. 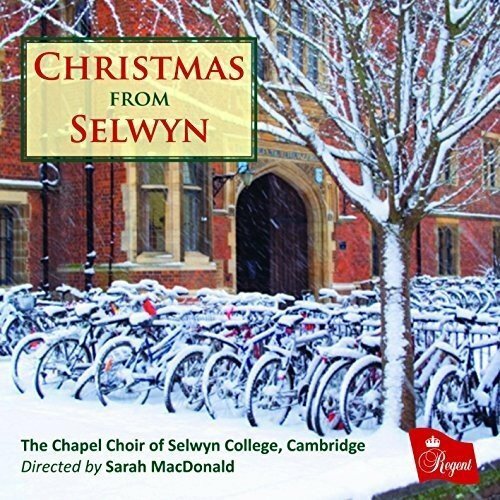 There is an attractive sprinkling of lesser known pieces such as Andrew Carter's Mary's Magnificat, and Carl Rutti's I Wonder as I Wander, as well as the recent St John's commission, Michael Finnissy's John the Baptist, plus Bob Chilcott's The Shepherd's Carol (commissioned for King's College Choir). We open with the Chilcott, which makes for a magical, almost spine-tingling start. I was particularly taken with the clear textures and spicy harmonies of Cecilia MacDowell's O Oriens, and Finnissy's lively new piece is no either sing either with its tricky rhythms. This disc makes a fine showcase of a choir on the top of its form. Moving away from the organ loft, in To Bethlehem the Kantorei of Kansas City (a professional group based in Kansas), conducted by Chris Munce, present an interesting mixture of Renaissance motets by Melchior Vulpius, Claudio Merulo, Jakob Reiner, Giovanni Bassano, Blasius Ammon and contemporary music by David Basden (born 1957), Jocelyn Hagen (born 1980), Douglas Helvering (born 1977), Matthew Culloton (born 1976), Ivo Antognini (born 1963) and Kim Andre Arnesen (1980). The programme is constructed as a telling of the Christmas story, and the relatively unusual selection of composers (both Renaissance and Contemporary), ensures an interesting journey. This is an impressively performed disc, with the seventeen-strong choir switching between Renaissance and various contemporary modes. The King's Singers Christmas Songbook mixes songs such as Santa Claus is Coming to Town with popular carols in the Kings Singers own distinctive way, with arrangements by Alexander L'Estrange, Keith Roberts and Robert Rice. The ensemble's particular vein of intelligent close-harmony singing still stands out as a beacon, and the selection manages to successfully encompass both the serious (Gustav Holst's In the bleak midwinter and Silent Night) and the frivolous (Frosty VS Rudolph, the re-boot). Another a cappella group, Siglo de Oro, director Patrick Allies, takes a rather interesting route. 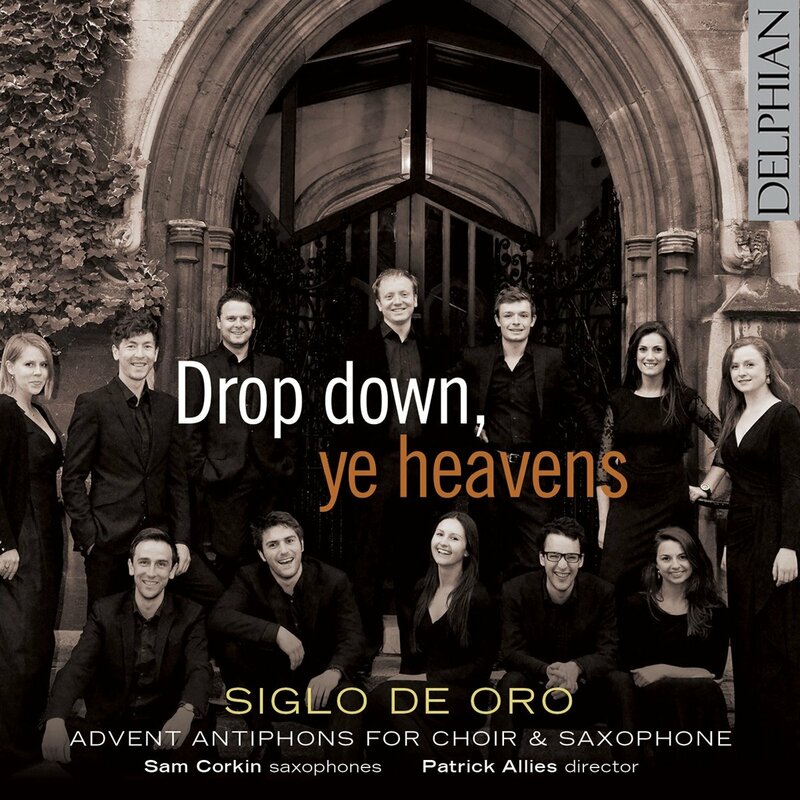 Drop down, ye heavens, Advent antiphons for choir & saxophone, is a collaboration with the saxophonist Sam Corkin. The centre-piece of the programme is a set of the great O Anthems, for choir and saxophone, commissioned from Will Todd (born 1970), Matthew Kaner (born 1986), Samuel Rathbone (born 1986), Francis Pott (born 1957), Richard Allain (born 1965), Gareth Wilson (born 1976), Stuart Turnbull (born 1975) and Ralph Allwood (born 1950). The result is an impressive debut disc, with fine singing indeed from the twelve to fourteen strong group, and a lovely range of stunning textures in the works with saxophone. Definitely a hit for those looking for something seasonal and imaginative but not traditional. The final disc in my selection is not strictly Christmas, it is music for Epiphany. 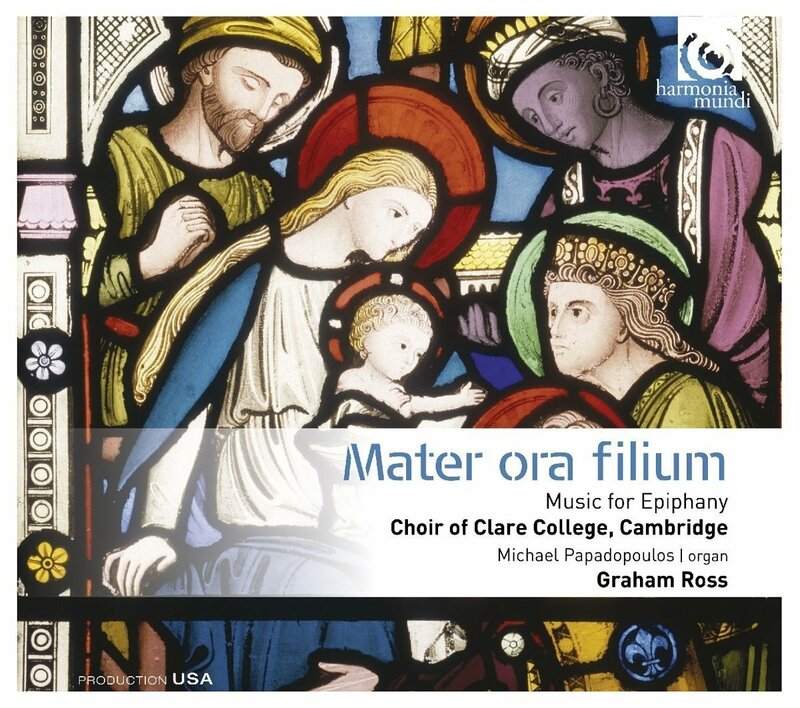 Mater ora Filium sees Graham Ross and the Choir of Clare College, Cambridge with Michael Papadopoulos (organ) performing a striking programme which moves from Lassus's Omnes de Saba, through John Sheppard's Reges Tharsis, and Jean Mouton's Nesciens mater, to Judith Bingham's Epiphany, and Judith Weir's Illuminare, Jerusalem, culminating in Bax's glorious Mater ora filium. Ross has added a few hymns as well, to provide a lovely balanced programme. I was particularly taken with the sound of the young voices in Bax's taxing work (and the sopranos certainly nail the very long top C required of them), but equally the Sheppard and the Mouton provide some finely crafted polyphony and a lovely blended sound. This is a remarkable varied mix of discs, certainly with 'something for everyone. 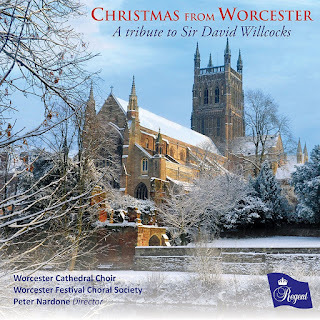 Christmas from Worcester - Worcester Cathedral Choir, Worcester Festival Choral Society, Sennet Brass, Christopher Allsop (organ), Peter Nardone (director); Regent - Available from Amazon. 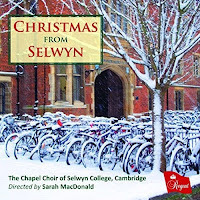 Christmas from Selywn - The Chapel Choir of Selwyn College, Cambridge, Shanna Hart (organ), Ben Comeau (organ), Sarah MacDonald (director); Regent - Available from Amazon. 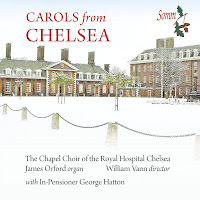 Carols from Chelsea - The Chapel Choir of the Royal Hospital Chelsea, James Orford (organ), William Vann (director), with In-Pensioner George Hatton; Somm - Available from Amazon. 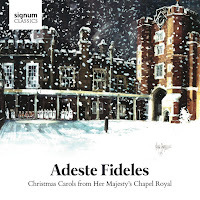 Adeste Fideles, Christmas Carols from Her Majesty's Chapel Royal - Choir of Her Majesty's Chapel Royal, Martyn Noble (sub-organist), Huw Williams (director of music); signum classics - Available from Amazon. 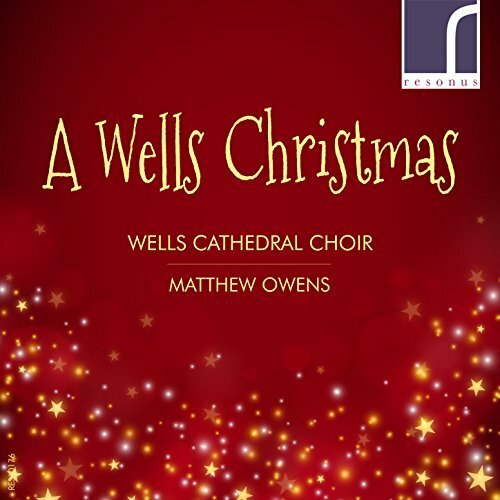 A Wells Christmas - Wells Cathedral Choir, Jonathan Vaughan (organ), Matthew Owens (conductor); Resonus classics - Available from Amazon. Thomas Hewitt Jones Christmas Party - Simon Hewitt Jones (violin), the Royal Ballet Sinfonia, Gavin Sutherland (conductor); signum classics - Available from Amazon. 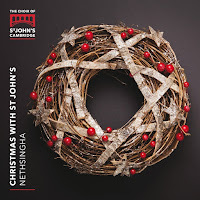 Christmas with St John's - The Choir of St John's Cambridge, Joseph Wicks (organ), Andrew Nethsingha (director) - Available from Amazon. 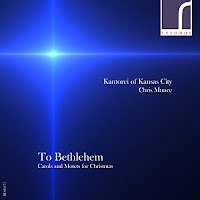 To Bethlehem - Kantorei of Kansas City, Chris Munce (conductor); Resonus classics - Available from Amazon. Christmas songbook - The King's Singers; signum classics - Available from Amazon. 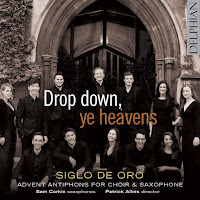 Drop down, ye heavens, Advent antiphons for choir & saxophone - Siglo de Oro, Sam Corkin (saxophones), Patrick Allies (director); Delphian - Available from Amazon.